Want some help earning badges? Girl Scouts, Boy Scouts, and Cub Scouts are encouraged to call our office to schedule a custom program that meets your Scout level and requirements. 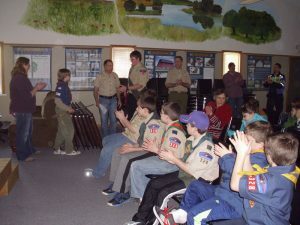 The Ney Nature Center also allows for Scout groups to camp on site. Below is a list of programs we can offer. We have the potential to develop other topics upon request. Click here to view our Group Program Cancellation Policy. Contact the Ney Nature Center for more information about cost, camping and to schedule a program.